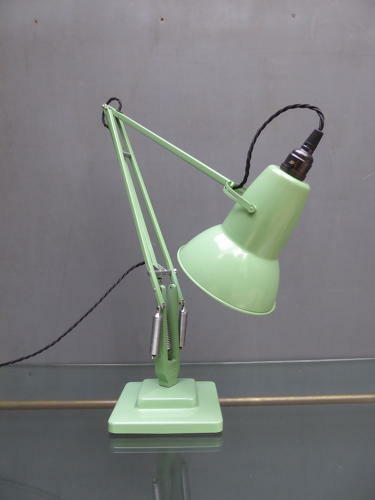 A fantastic example of a vintage Anglepoise 1227 desk lamp by Herbert Terry & Sons in the sought after pastel green colourway. An iconic design classic featuring the stepped base, original pastel green paintwork & tulip shade with this earlier version boasting the chrome fittings & 'rolled edge' shade which sets it apart from the later models. The lamp is a rare to find in this colour, particularly in this wonderful condition! Wear commensurate with age as pictured, an exceptional example, among the best I've seen to date. The springs & chrome fittings are all in excellent order & paintwork is extremely good showing only very minor signs of age. Height measurement above refers to the lamp as per the main image.